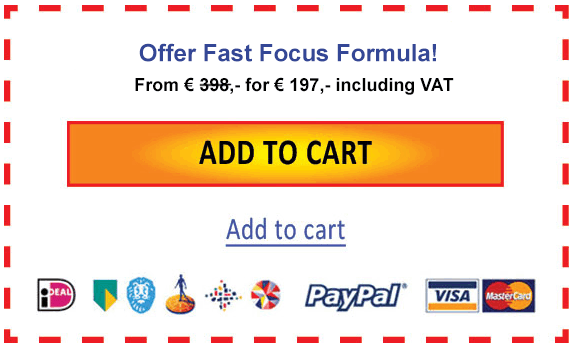 The Fast Focus Formula Module contains everything an HSP needs to become a rockstar at focussing, scheduling & planning. * You have problems staying focussed and you are easily distracted. * You want to have laser focus, but your concentration span is just to short. * You don't (always) work via a structured work method and you feel your productivity is suffering because of it. * You experience so many constant demands to your attention and everything and everyone is pulling you in different directions. * You start out with focus, a plan and goals, but you find it hard to keep that focus and get more specific on your goals. You will learn what influences your focus & concentration and which steps you need to take to deal with the distractions that are hindering you from achieving your goals and remaining focussed. You will learn how to increase your productivity by focussing on the essentials, so you are no longer overloaded with information and tasks and can allow yourself to get into that beautiful state known as “flow”. You will also learn how to plan your workload in a way that minimizes your struggle with focus, so you can plan ahead more effectively and you’ll always know the next step – meaning that you’ll be less tempted to simply stop. LASER FOCUS - Because knowing how to removing the distractions that prevent you from concentrating will greatly improve your focus. CLEAR PERSPECTIVE - Because you now have a plan that depicts exactly which steps to take to achieve your goals, so you always know what the next step is ging to be. STRUCTURED WORKMETHOD - Because you are now able to add structure to your day, know which tools to use to increase your prodcutivity and have a smart way of planning your workload. NO DISTRACTIONS- Because you created a distraction free workplace and work method for yourself, that allows you to have laser focus and increases your prodictivity. INCREASED PRODUCTIVITY - Because distractions are no longer breaking your focus and you have an actionable plan in which you only focus on the essentials. The Boost Concentration Plan helps you to boost your concentration so you can remain focussed in the age of distractions. The Eliminate Distractions Protocol will help you to eliminate all distractions from your workplace and workmethod so you can sharpen your focus. The 5 Second Rule helps you to get the momentum you need to actually get things done. This will benefit your focus & your productivity. The Pomodoro Technique teaches you to work with time, instead of struggling against it. This will greatly improve your productivity. The From Chaos to Focus Map helps to plan your workload in a way that minimizes your struggle with focus so you no longer feel stressed and overwhelmed . Click on the image below to register now for this amazing, one of a kind module that any HSP needs to have have laser focus and an actionable step-by-step plan to reach your goals.